Panel participants from left to right: Nezir Sinani, BIC Europe; Helena Wright, E3G; Jason Allford, Australian ED to the World Bank; and John Roome, WBG Senior Director, Climate Change. 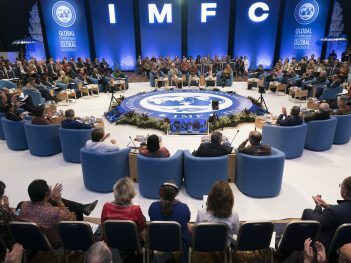 Multilateral Development Banks (MDBs) have a vital role in supporting member countries to meet the agreed goals under the Paris Agreement on climate change. How can they align their activities and shift investment from fossil fuels to clean energy? This event will present the latest research and case studies. This event was co-sponsored by E3G, Bank Information Center Europe, Christian Aid and Urgewald. Jason Allford, Australian ED to World Bank: Climate change is a political issue. 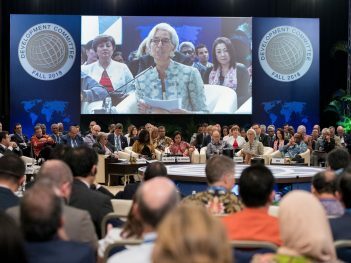 There are tensions within the World Bank’s Board on this issue, and the differences in position are evident in my constituency, where I represent Australia, which has been slow in implementing the Paris Agreement, along with ten of the Pacific Island Countries, who are at the front lines of climate change impacts including sea level rise. 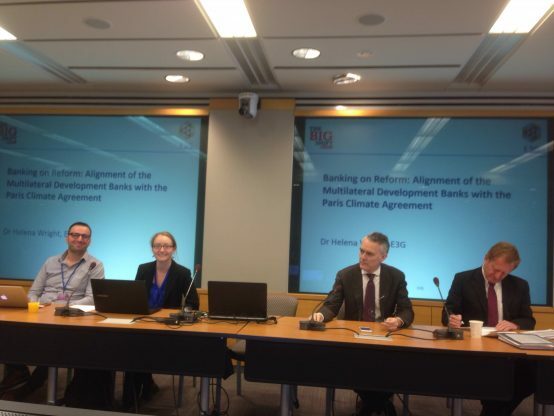 Helena Wright, E3G: A new report which will be published in May, entitled ‘Banking on Reform: Alignment of the Multilateral Development Banks and the Paris Climate Agreement’, ranks MDBs across a number of areas, in terms of how they are aligning themselves with the Paris Agreement. MDBs are in a really catalytic position for achieving global climate goals. Yet, across the MDBs, climate finance has hardly increased over the period FY13-FY16, and funding for fossil fuels continues. This was particularly discouraging as many of these fossil fuel projects were approved in the wake of the Paris Agreement. Energy finance: According to the figures reported to the OECD, ‘green’ energy finance (renewables) versus ‘brown’ (fossil fuel) finance ratios across the major MDBs vary. For the WBG, there was 1.1-1.0 ratio for 2015-16. There are some issues with how data is reported to the OECD, which reflects larger challenges of accounting for climate finance). Greenhouse gas accounting in the MDBs: All the MDBs included in the scorecard are adopting this, to differing degrees. Shadow carbon pricing: again these approaches vary across the MDBs. Recently WBG has committed to aligning its internal carbon pricing with internationally agreed best practice. 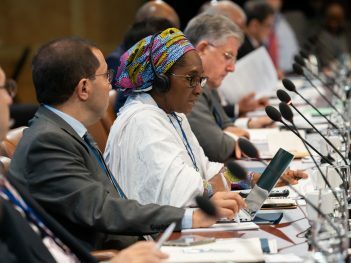 Support for developing countries’ Nationally Determined Contributions (NDCs) to the Paris Agreement: All the MDBs provide some level of support. 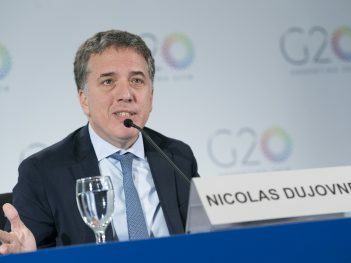 The Inter-American Development bank (IADB) has an example of best practice, which is its NDC Invest programme. Green bonds: another area most MDBs are active in. 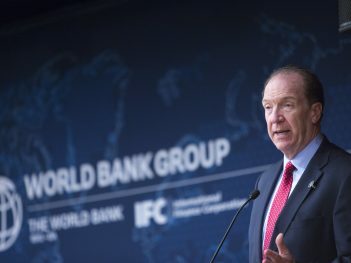 The World Bank Group, including the International Finance Corporation, has been active in growing the green bonds market over the past decade. Potentially transformational case studies: These include IFC’s EDGE programme, which is a no cost assessment tool for green buildings. Where MDBs are leading and where they’re lagging behind: For IADB – it’s supporting countries with deep decarbonisation, but doesn’t currently have an internal shadow carbon price. For WBG: only MDB to rule out ‘upstream oil and gas finance’, but still has largest fossil finance portfolio across major MDBs. Lack of data in some areas: for example, there is little information about how much climate finance is going to forests, across all MDBs. Recommendations for WBG: Should consider updating energy strategy to reflect recent climate commitments; ensure GHG incorporates best practices; long-term 2050 planning (NDCs under Paris don’t get us to where we need to be under Paris Agreement). Nezir Sinani, Bank Information Center Europe: As John Roome will likely talk about in a bit, the World Bank is doing a lot of good things on climate change. 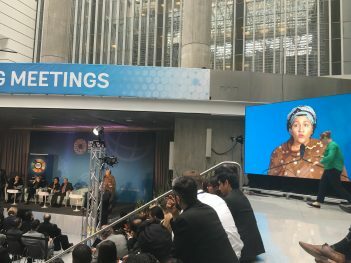 But in this presentation, I am going to look at how fossil fuels are being financed by the World Bank indirectly, and discuss the ways that this is occurring. Financial intermediaries (FIs): Case study – the Philippines. There is currently a case under investigation by the IFC’s Compliance Advisor Ombudsman (CAO), stemming from a complaint filed in October. The CAO has accepted the case of 11 communities who say they are negatively affected by new coal power plants. IFC provided equity investment to commercial banks in the Philippines, who then provided finance for these coal plants. This is the first complaint to the CAO that specifically cites climate change as one of the reasons for the complaint. IFC argues that when they invest in a bank, they can’t help it if that bank then invests in coal if it’s part of the country’s energy mix. IFC says: “As Financial Institutions’ portfolios reflect the economic activities of the countries they operate in, many financial institutions continue to finance assets such as coal plants.… For example, in the Philippines, coal accounts for 45% of the energy supply and is part of the national energy strategy.” This line of thinking suggests that when the IFC invests in a bank, it lingers in the background, hardly altering a bank’s behaviour. Yet RCBC’s (the FI in the Philippines link to CAO complaint) track record plainly shows otherwise. In fact, under the IFC’s watch, RCBC tripled its investment in coal, helping to kick-start the coal expansion in the Philippines. IFC must use its influence to shift banks towards renewables and away from fossils. It’s not enough to fund renewables with one hand, while still lending to fossils with the other. Coal exposure tracking: as with the vast majority of the FI portfolio, there is close to zero transparency around where investments end up. We can only reveal the shocking stats on coal because of access to expensive market databases like Thomson Reuters and Bloomberg. IFC must insist that borrowers disclose at a minimum the name, sector and location of sub-projects they invest in. That way civil society and affected communities can track whether IFC is truly changing its behaviour and backing out of fossils. IFC argues that it can’t be done, saying, “Portfolio-wide, client-level disclosure is not standard practice by financial institutions in developed markets, and will be challenging to institute in emerging markets.” But that’s not the case. Right here in the US, the American EXIM – OPIC – also lends to financial intermediaries. 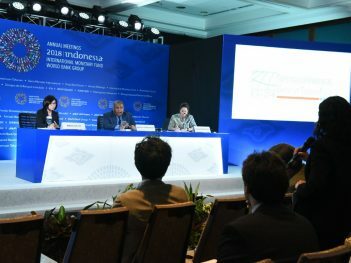 OPIC currently releases subproject information, such as sector, location and amount regardless of whether the client is a bank or a fund – so IFC can and should do the same. We want IFC to lead in its FI investments, not follow from the background. IFC must insist that borrowers disclose projects publically, so that affected communities can raise concerns while the project is in the proposal phase. Currently, in order for CSOs to get access to this information, we have to subscribe to databases like Bloomberg’s investments database, which costs $30,000 a year. Development Policy Loans (DPLs): the Bank requires ‘prior actions’ (regulatory changes) before countries can take out these loans, which provide them with general budget support. In our research on four DPLs in Mozambique, Indonesia, Peru and Egypt, policy reforms that encouraged public-private partnerships directly benefitted the fossil fuels industry after these laws came into place. These are effectively fossil fuels subsidies, and we want the Bank to look at who benefits from these types of regulatory changes. John Roome, Senior Director, Climate Change, WBG: Addressing climate change is fundamental to the WBG’s twin goals of achieving shared prosperity and ending extreme poverty: it will hit poor the hardest. The recently published Groundswell report by the World Bank suggested that 140 million people in developing countries could be forced to undertake internal migration by 2050, without significant interventions. We’re making progress on climate action. The Bank is on track to meet climate-related finance targets under the 2016-2020 Climate Change Action Plan, which calls for 28 per cent of our investments to be climate-related by 2020. We’ll be announcing updated climate targets at COP24 in Poland later this year, where we will give a transparent update on progress. We’re working with a number of countries on their NDCs (Nationally Determined Contributions to the Paris Agreement), although we’re not currently publishing what we’re doing. We’re also part of multilateral discussions on a partnership strategy for 2050 planning – which considers what the world will look like in 2050, including low-carbon but also climate resilient infrastructure. In the case of DPLs, we believe that these are actually key to driving climate action. More ‘prior actions’ can be used to drive green growth, and more and more DPLs actually include these types of prior actions. On leveraging finance, we’re very active in the green bonds market development, and in working with developing countries to launch these bonds. On alignment with the Paris Agreement, we’re integrating internal carbon pricing into project proposal analysis across the WBG. We’re also working with UNFCCC to validate our greenhouse has (GHG) accounting methodology, which we’ll make public later this year. For the new ESF [the bank’s new Environment and Social Framework safeguards] there is also a requirement to do project-level GHG accounting. On financial intermediaries (FIs): the WBG does not directly finance any coal power plants since the ESKOM deal [a loan to South Africa in 2010], and made a pledge in December, to phase out finance of ‘upstream’ oil and gas after 2019. We’re also trying to create the market for renewable energy. Neither IFC nor the Bank allows direct financing for coal. Nezir was referring to general financing for FIs, which is not tracked. Having said all that, building strong financial institutions in developing countries is absolutely key, so we have to balance finance for FIs with policies to prevent coal explosure. On the issue of green-to-brown finance ratios – we need to come together with CSOs on a common basis for this data, as your numbers and ours are quite different. Juan Pablo Bonilla, Inter-American Development Bank: More important than increasing climate finance is mainstreaming climate action across the institution. We have been working on developing a transversal approach across our different areas of work, in order to mainstream climate action. The role of donors is important. The more you’re able to work with countries to develop transversal approaches, the more impact you can have. The key is to develop transversal approaches that build a bottom up approach. Adaptation is way more complicated to invest in than mitigation, which is most of our climate finance. Sustainable infrastructure is key; there is a need to work upstream with governments to ensure these projects enter the pipeline. We also need to include factoring in climate risk with adaptation. On internal carbon pricing: we don’t have an approach, and we’re asking other MDBs and investigating different approaches. But honestly we’re not quite ready; we’re trying to build mainstreaming from the ground up. Jon Sward, Bretton Woods Project: How are the Bank and IADB currently working with countries on understanding the risks of stranded assets, with respect to planning for a low-carbon transition on the 2050 time horizon. Christian Donaldson, Oxfam: On FIs, will IFC publically disclose how clients are exposed to coal? Representative from Young Diplomats of Canada: Is the upstream pledge a double standard in terms of the World Bank cutting off poor countries from a development path that developed countries have used, in terms of being able to access finance to develop their natural resources? Mongolian CSO: The Bank is doing technical analysis of coal expansion in our country, which will be funded by China. John Roome: On the upstream pledge, we understand the critique, but ultimately we don’t feel funding ‘upstream’ oil and gas, given the current climate challenges, is a good use of the Bank’s relatively scarce public funds. On Mongolia, I’d be very surprised if the Bank is heavily involved in this. 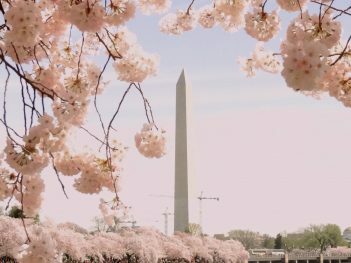 On this issue of FIs disclosure, this is a live discussion but one that goes much broader than merely climate issues, and touches on financial inclusion. So it requires a discussion across different parts of the Bank in order to move forward. We’ve begun analytical work towards planning for 2050. On low-carbon infrastructure and stranded assets: within sectors there is ongoing dialogue with those countries who are dependent on intensive extractive industries about ways to get them on a different pathway. Juan Pablo Bonilla: Stranded assets and sustainable infrastructure involves a difficult discussion. But it’s very important, especially for long-term planning. The lead of our climate division has been very active in creating awareness, and I think there is very limited knowledge within Central Banks about this issue and so we are working to communicate this. Jason Allford: On the upstream pledge, developing countries are asking us for helping in adapting to climate change. They want our help with their NDCs, and renewables are now much more competitive, so for the island nations I represent this is much more sustainable than being dependent on importing oil and gas.